Blizzard's planning to make opening Hearthstone card packs more exciting, starting with the next expansion. 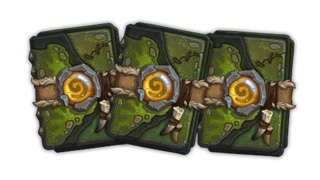 If you're a Hearthstone player, the odds are that you've complained about duplicate cards in packs at least once. Well, Blizzard has heard those complaints, and when the next expansion launches, the company plans to do something about them. The changes were announced in a post on the official Hearthstone blog. Starting with the next expansion, when you open a pack that contains a Legendary card, it will be a Legendary from that set that you do not own. Once you own a Legendary card (golden or non-golden) you won't get a duplicate of it until you have collected all the Legendary cards from that set. In addition, you'll never receive more copies of any one card in a pack than you can use in a single deck. Another new change is that you will be guaranteed to receive at least one Legendary within your first ten packs of a new set. All of these changes will apply to packs from all sets, not just those from the newest expansion. There's no word on what the next expansion might be, or when it might launch. That said, these are some positive changes to card packs that we'll see once it rolls out.